Note: If you found this post via a search for “gluten free”, “corn free”, “food intolerance” or related phrases, “OCD”, or “Yaz” (or via my categories or tags on those topics), please see this important message about updated information. Thanks! My apologies to anyone who found this post by googling Katy Perry and then was disappointed to land on the blog of a middle-aged woman who blogs about her health and feeling old. I would have written this as two separate posts, but it all goes together, for me. . . 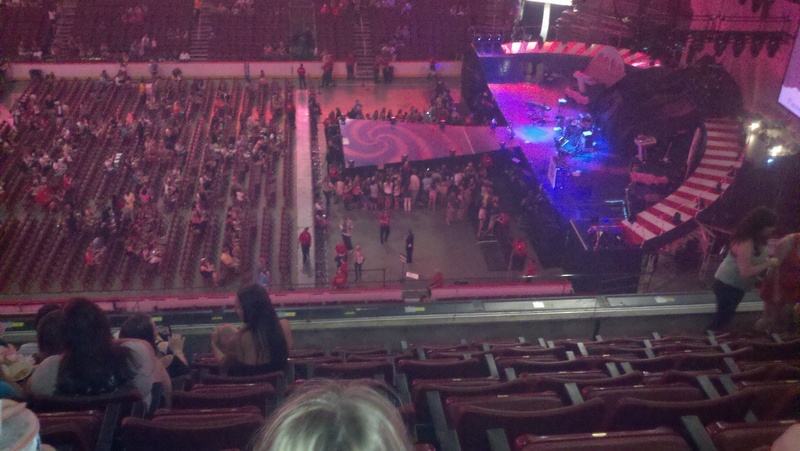 So, SS and I went to see Katy Perry in Philadelphia a week ago Friday night. It was such a great show! Fun and funny and high-energy, with sweets and a purple kitty and lots of colors and sparklies and dancing and costumes and bubbles and confetti and water and pyrotechnics, not necessarily in that order. Really, really fun. The tickets were part of my birthday present from SS, and it’s been like a gift that keeps on giving, while we waited for the day to arrive, then enjoyed the show, and then as we found ourselves going around still singing her songs, days later. It was a long time since I last went to a concert. I remembered that the last concert I’d been to was Melissa Etheridge, and I thought it was probably her Breakdown tour. I looked it up and it was October 9, 1999. Over eleven and a half years ago. I’ve aged a lot in those years. I’ve always had the balance/gait issues that have caused me to feel older and less able than my peers, but they’ve gotten worse in the last several years. Or else my anxiety about them has gotten worse. Or both. I’m not exactly sure. Our seats were up high, and I was terrified that I was going to fall and tumble-all-the-way-down-to-the-floor-and-die (that’s the way the words kept going through my head), until we were firmly seated and I had time to breathe through my anxiety and adjust. I remember, as far back as my early 20’s, feeling very uncomfortable and unsteady on my feet when climbing the steps and getting to my seat in stadium-seating. In fact, I can even remember feeling that way in high school, climbing in the bleachers. My friends through the years would sometimes tease me, sometimes just look very confused, as they tried to reassure me that I wouldn’t fall, and tried to understand why I was so afraid I would. Once, when I was around 23 or 24, I went canoeing with some friends. We stopped so we could get out of the canoe and swim down into some springs. The water at that point was about waist-deep and we were walking on rocks. We all had sneakers on, but I was still feeling very unsteady and throwing my arms out for balance as I moved really slowly. One of my friends said something like, “You really are a girly-girl, aren’t you?” I was confused about that and never forgot it, because although I was never what anyone would call “masculine”, I also never thought of myself as a “girly girl” either. I never understood why I always felt like I was going to fall and it seemed that nobody around me ever felt that way. It’s the reason I don’t like to drink very much, in fact, as it just intensifies that effect. Of course, my anxiety Friday night was exacerbated by having been to the gynecologist that afternoon (more on that in another post), and medical tests and procedures always heighten my anxiety to begin with. The appointment was already made before SS got the tickets, and I didn’t want to wait longer to see the doctor by rescheduling, so it was just one of those things. So, in recent months, I have wondered whether I may have gluten ataxia, and have been wondering how much of my balance/gait issues are from the Fibromyalgia. More recently, I’ve been learning about Sensory Integration Disorder / Sensory Processing Disorder. I was already aware that many people with ADD/ADHD have heightened sensitivity issues with things like clothing tags, seams in socks, and noise in crowds, and I was also aware that this can be prevalent and even extreme for many people with Autism, but I didn’t know what all it encompassed until I was discussing it with a friend who is a Learning Specialist and works with a lot of kids with ADHD and Autism and learning disabilities. I’ve been aware that I was hyper-sensitive to a lot of sensory things, like wearing jewelry, and clothing that is uncomfortable because of tags or waistbands that roll or twist. I haven’t worn a watch for years, and it’s only been within the last year or so that I’ve been able to wear jewelry on a regular basis again. The ADD meds seem to help with that, although they don’t help with most of my other sensory issues. My charm bracelet still bugs me and I can’t wear it for more than an hour or so, but on most days now I’m able to wear other jewelry (that is one reason I’m so excited about getting into beading lately). On high-anxiety days, though, the jewelry comes off. I’m always fussing with my clothes. It feels almost compulsive to me. I often readjust the air vents in the car because the air blowing across my skin drives me nuts, and I don’t like to be tickled or touched with a soft feathery touch. A lot of people I’ve known have loved that and I never did. I never knew why. It turns out, though, that there are a lot of issues affected by Sensory Processing Disorder that apply to me. I filled out the adolescent / adult checklist on the Sensory Processing Disorder web site and I was surprised by the high numbers I scored in every single category. What also surprised me is that I seem to be hypersensitive to certain things and hyposensitive to others, even within the same sensory categories. I am getting ready to begin therapy again locally, and I plan to look further into this, and to try to find an occupational therapist who I can work with as well. I’ve been finding it difficult to find a lot of information on Adult Sensory Processing Disorder, since it’s usually diagnosed in childhood. I can look back to my childhood and clearly see it, but there wasn’t much awareness about it, then. In fact, when I was about five or so, my mother took me to a psychiatrist to find out if I had autism because I used to rock for hours, whether it was on my rocking horse as a little kid, or in rocking chairs throughout my childhood and into my adulthood, or just sitting on the floor or in a regular chair. I also, at that time, began doing this focus thing where I would hold my hands in fists up close to my face and cross my eyes. I’m sure it looked frightening to others around me, but from my perspective, it was simply a tool for concentration and was something I would do when I was “within”, in my imagination, which is a place I still love to go and am very comfortable. To those around me, it would look as if I were shutting them out, and I suppose I was, but I was able to come and go at will, between the real world and my imagination, and it didn’t feel odd or strange to me. I still rock, mostly either first thing in the morning before I’ve taken my ADD meds or in the evening, after the meds have worn off. I often am not even aware I am doing it, and it’s just a part of me. The mention of the sympathetic and parasympathetic nervous systems rang a loud bell. When I had the laser retina surgeries earlier this year, and had the anxiety-almost-passing-out reaction after the fact, with both surgeries, the doctor explained to me that the delayed reaction had to do with the sympathetic and parasympathetic nervous systems. I didn’t quite understand when he explained it, but I think he was saying it had to do with the transition from one to the other. Now I wonder if it is also a symptom of SPD. Someone I was in communication with about Adult SPD recommended the movie “Temple Grandin“. SS and I rented it and loved it! Even though I don’t have autism and even though my sensory issues are different from hers, I got it, and I was very affected on an emotional level by the movie. Parents and teachers often ask – “How can I tell if my child has sensory problems?” My simple answer is this: Watch your child closely – the signs are there. Do you see him putting his hands over his ears to block out noise? Does he become agitated every time you are in a bustling, noisy, or chaotic environment? Are there certain textures of food he just won’t tolerate? Do you find her pulling at or taking off clothes that have rough textures or tugging at necklines where tags are rubbing? Children and adults who tantrum and cannot tolerate being in a large supermarket, such as Wal-mart, are almost certain to have sensory problems. I complained a lot about tags in clothing as a kid, but if Mom cut them out they would often be more annoying because she didn’t completely remove them; she would cut them and then the cut edges would feel like razor blades to me, so I learned to keep my mouth shut about those tags. Instead, I would wear only shirts that had soft tags until I got old enough to remove the stitching so I could take the entire tag out myself. I’m thrilled about how many clothing manufacturers are making shirts and blouses without tags now. The food texture thing is interesting, also. For as long as I can remember, I have been unable to eat anything with cooked raisins or cooked apples in it. Even imagining the texture of either against my teeth sends me reeling. I remember when I was a kid and my parents and I went to see True Grit in the theater (the first one; I was five when it came out). It was noisy and there were loud guns and people yelling, and I came out of the theater in tears. Not just crying, though. Sobbing, and gasping, and almost feeling traumatized. My mom was confused by my reaction, but in the years since, when we’ve talked about it, she has explained it the same way I have; that I was a child who didn’t like loud noises and that was probably because we were a quiet family at home and I wasn’t used to loudness. I think it’s more than that, though. My sister was raised in the same house and it not so bothered by noise. Before the concert started the week before last, and while I was still in meltdown and trying to breathe through my fear of falling, there was a DJ playing some loud, pounding dance music before the opening act (Marina & The Diamonds – we both liked her a whole lot!). The beat of the DJ’s dance music was extremely upsetting to me. The vibration in my chest felt like palpitations, I felt like I couldn’t breathe, and the music felt, to my anxiety, like something akin to poking an angry wild animal with a stick. Once the DJ was done, I felt better, and the base in Marina’s and Katy Perry’s music didn’t bother me because it wasn’t that same repetitious, redundant sort of techno-beat. I have never liked techno music for that reason, and I also now understand why I have always had such anxiety whenever I’ve attempted to go out with friends to a bar or night club where there is dancing and loud music with that same sort of beat, and I also understand, now, why I reverted to feeling helpless and childlike in that anxiety, every time it would happen. So anyway, I’m finally beginning to understand myself better, even if it is much later in life than I would have preferred. See? And you didn’t think that Katy Perry and some old lady in New Jersey who has bad balance could possibly fit together into one blog post, did you? After reading a number of your blog posts, I was wondering if you’ve seen some of the information about the variation in gluten tolerance in Celiacs/gluten intolerant folks? Or the idea that gluten free foods may not be completely safe for all people who need to eat gluten free? This is all from a letter to the FDA, and also sited sources for the above information within the letter. The reason I bring this up at all is that some of the issues you have are ones that I have had as well: sensory processing issues, balance issues, depression, anxiety, and reactions that there’s no answer for. That reaction where you know you got hit with something, but it just doesn’t make sense, because you can’t think of how it could be gluten, but you haven’t found an answer anywhere else. Gluten attacks my gut (I did have a positive test), but it doesn’t seem to make it hurt, thankfully. I just get the neurological and other problems. But eating little enough gluten to make my blood tests come back normal didn’t make the rest of me feel 100%. I still had a lot of issues that never went away. But when I started investigating how much gluten my gluten free food actually contained, and avoiding it, my symptoms went away. Currently, if I haven’t been ‘glutened,’ my balance is fine for the first time in years. Depression is gone. Light touches and loud noises and an amazing number of sensory issues are completely gone. Aches and pains are almost completely gone (minus some permanent damage from years of gluten). I can get gluten enough that it brings them back, but it doesn’t affect my gut at that level (had a negative biopsy when I was sick as a dog from getting low level gluten cc). However, that level really sets off all my symptoms something fierce. And we thought for a long while it might be corn, too, as I recall you were looking into a while back (by the way, corn is in all iodized salt, too, so man is it hard to avoid.). Might be worth while checking it out, if you are still having troubles and haven’t found the answer why yet. – gluten cc’d cabbages due to cabbage cutworm bait that had wheat flour added to it and sprinkled all around the cabbages. – gluten cc’d avocado oil from a company that processed wheat germ oil on the same line. – gluten cc’d oranges from cc’d packing paper (we actually tested the paper, and it came back positive for gluten. It was wild). I honestly can’t adequately describe how much of an impact getting rid of this gluten this has made, even just emotionally. My food choices are crazily restricted, and yet I’m feeling less stressed and depressed than when I ate whatever I wanted. Wow, Shauna. Seriously . . . wow. Thank you so much for your comments (and I’m excited to read more of your blog – so much content that I can identify with that I don’t know where to start)! I’d recently begun to wonder if maybe I was just being overly paranoid about gluten, yet I’m still having my off-and-on reactions to *something*, and feeling kind of helpless about figuring it out. I’d begun to wonder if maybe my problem isn’t gluten at all, but something else entirely, but I keep coming back to the shocking night-and-day difference in how I felt within a day or two of going gluten free back in 2007. I have a new doctor, who I am planning to blog about but haven’t had time, and I’m going to have several tests (probably in October), including the Alcat Food Sensitivity test. He’s also doing various testing related to the Autonomic Nervous System, which I find fascinating and plan to blog about that, too. I’ve read a little bit about the FDA proposed labeling and I’ve been trying to find time to read more about it and share my own comments with them. Am I understanding correctly that they are (were?) thinking that <20ppm was sufficient for gf labeling? I think that would be doing a huge disservice to any consumer who must be gluten free, not only because so many people react to levels much lower than that, but also because I think it would leave no motivation for companies to bother to have dedicated lines or to worry about cc. As it is now, at least we have the option of learning whether or not a company has dedicated lines and basing our decisions on that. Anyway, thank you again for your comments and for the great additional information! 58 mySQL queries in 0.829 seconds.